Is it out of the question to believe that Lou Brown is the right man to bring the Cleveland Indians to their first World Series title in 60 years? After a disappointing 81-81 season in 2008 the Cleveland Indians have been busy this offseason signing former Chicago Cubs closer Kerry Wood to fill the meteor sized hole in the bullpen. This allows Indians fans to forget about the likes of Joe Borowski and Bob “Two Chipotle Burritos in the Bullpen” Wickman. The Tribe has also improved their roster via trade. Cleveland found the 3rd baseman they desperately needed in Mark Derosa of the Chicago Cubs. They also received Joe Smith, a submarine-style reliever and Luis Valbuena, a 2nd base prospect in a 3 team trade involving the NY Mets and Seattle Mariners. The Indians moves this offseason have not only given them the talent, but the depth to push for the AL Central title again in 2009. This makes the leash on Eric Wedge even shorter, leading me to believe that if the Tribe indeed happen to break our hearts again that Lou Brown is the man in 2010. Eric Wedge is a career .233 batter with 5 Major League Home Runs and 12 RBI’s. With career numbers such as those you have to believe David Delucci and Eric Wedge have analyzed and compared one another this offseason. Im certain they have a lot in common. 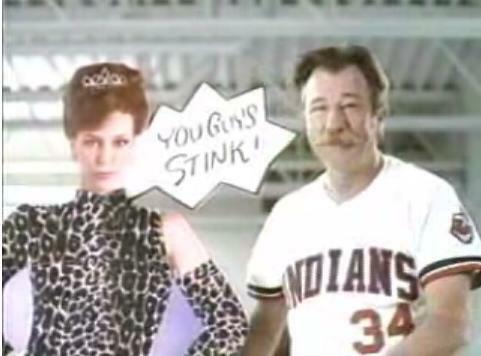 You may be asking what Lou Brown can bring to the Indians organization that Eric Wedge cannot? Lou can help “Pronk” from swinging the bat like Pat Thompson in 2009, like he helped Perdo Cerrano handle the breaking ball against “The Duke” in the one game divisional playoff game against the NY Yankees. Next, only Lou Brown was wise enough to move Ricky “Wild Thing” Vaughn to the closer role with the Tribe’s bullpen being in schambles, much like the 2008 season in C-Town. Finally, after breaking down film and watching Willie “Mays” Hayes score from 2nd base on the “Called Shot” bunt to defeat the Yankees in the bottom of the 9th there is no chance that Kenny Lofton would have been held at 3rd base trailing 3-2 in the top of 7th inning of game 7 in Fenway Park. Now this is all just speculation but if Lou Brown were to receive a call from the Cleveland Indians before the 2010 season I’m sure he’d hang up the phone with the guy on the other line asking about some white walls. You are currently browsing the archives for the Major League category.